The Internet is filled with hoax stories that people often fall for. 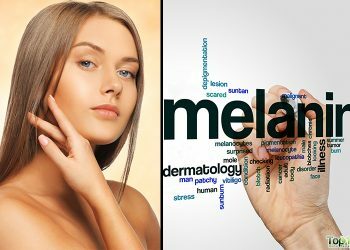 To draw your attention and arouse your emotions, most hoaxes either make exceedingly exaggerated claims or alert you to unrealistic health dangers that do not exist. 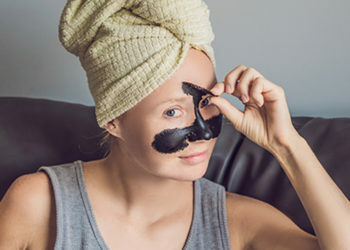 Interestingly, to sound legitimate, these stories claim to have come from reputable health organizations. Out of concern for loved ones and a desire to share the knowledge (though false! ), people tend to share the hoax stories without researching their truthfulness and reliability. 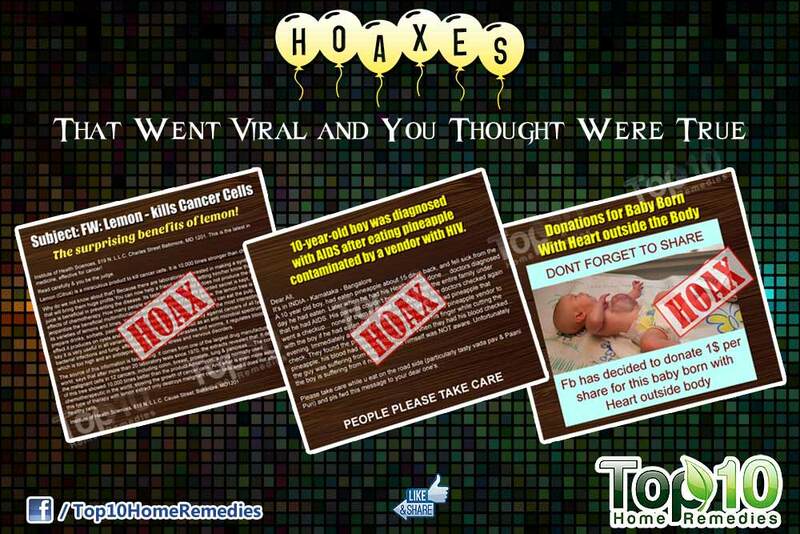 These hoaxes, however, only spread misinformation and cause panic. 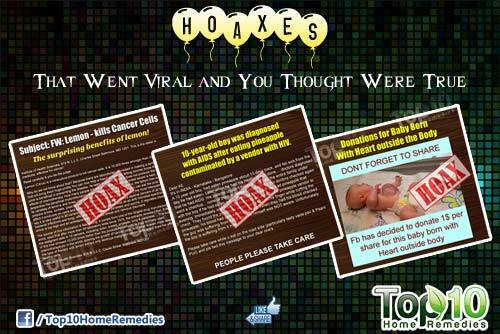 Here are a few popular hoaxes debunked. 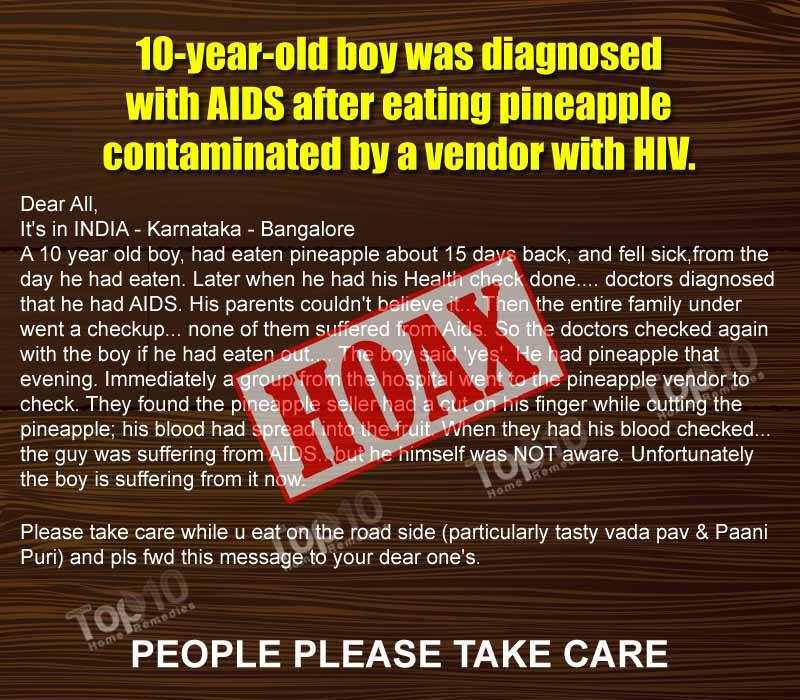 10-year-old boy was diagnosed with AIDS after eating pineapple contaminated by a vendor with HIV. This story, widely circulated through forwarded emails and social media, is untrue. There are also several variants of this story claiming that take-out food contaminated with infected blood caused AIDS in patrons. However, the claims in these stories are unsubstantiated and vague. 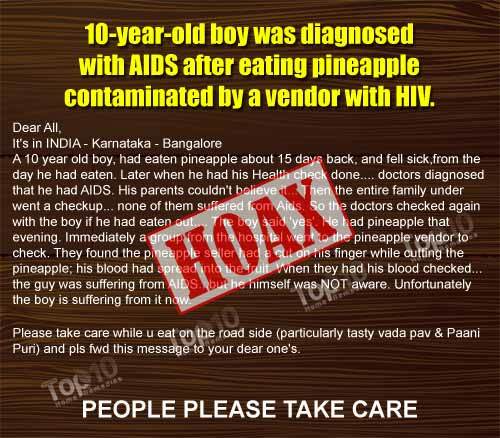 Moreover, the story states that the young boy “fell sick” with AIDS about 15 days after eating the supposedly contaminated pineapple. But, experts explain that there are important differences between HIV and AIDS. 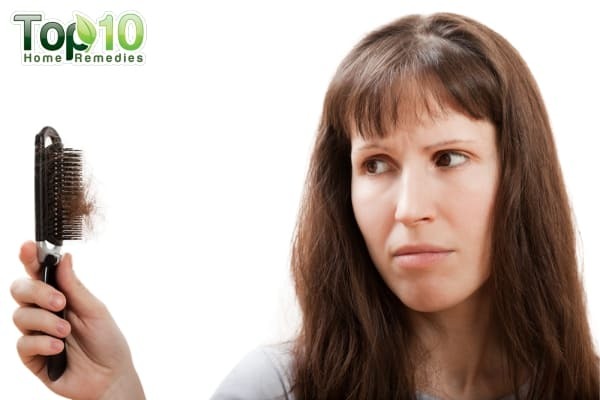 If left untreated, it generally takes 6 to 10 years from the time of infection with HIV to develop AIDS. Please do not pass on such bogus warnings to others as they only spread unnecessary fear and alarm. This is a popular social media post showing the image of a baby with a birth defect and pleading for you to help the baby by sharing the post to increase Facebook’s supposed $1 donation for each time it is shared. Facebook, however, has clarified that it does not donate money as a result of people liking or sharing content. The baby shown in this image is Hayes Davis. He was born on March 25, 2011, with a birth defect called omphalocele in which an infant is born with the intestines, liver or other organs sticking outside of the belly, covered in a thin, transparent membrane or sac. According to an ABC News report, to correct this birth defect, the baby underwent surgery in January 2012. The surgery went perfectly and the baby is doing fine now. 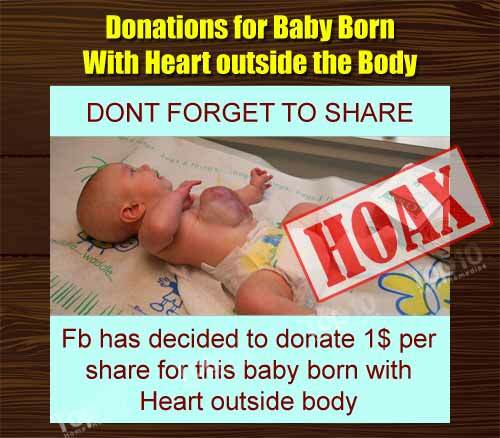 Facebook has stated that messages showing this image and claiming Facebook is donating money for the baby’s care are completely untrue and should not be encouraged. So, the next time you see this or other similar posts, report them to Facebook instead of hitting the Like or Share button. This is a common but misleading forwarded email with a significantly exaggerated and unsupported claim. 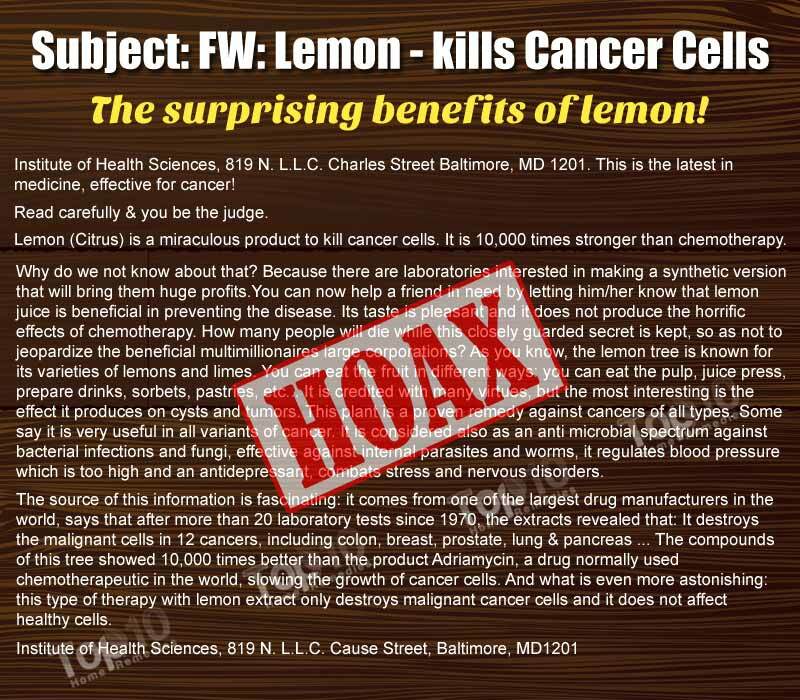 Claiming to have originated from the Institute of Health Sciences in Baltimore, the message states that lemon is a “proven remedy against cancers of all types.” The medical institute, however, has denied any involvement with this message. Scientific studies published in the last decade do suggest that lemons and other citrus fruits may possess substantial anticancer properties. 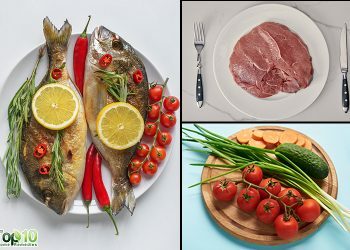 Compounds called limonoids mainly found in the skin and seeds of citrus fruits, in particular, have been found to have cancer-fighting potential, at least for certain types of cancer. But, most of the studies have been conducted on lab animals. 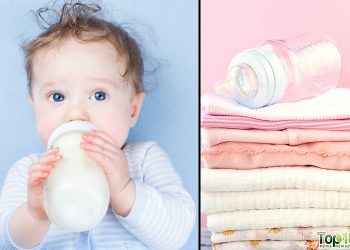 Further testing and research is still needed to determine the effectiveness of these compounds in preventing and fighting cancer in humans. 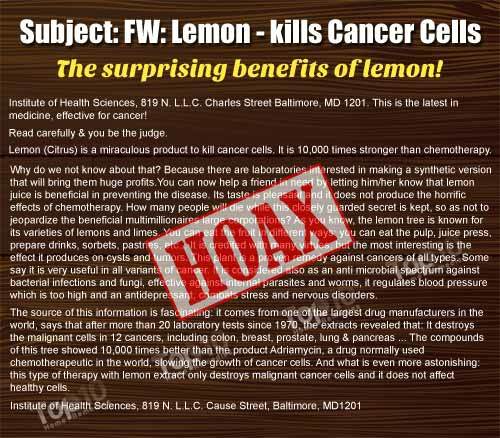 Thus, although lemons are a healthy addition to your diet, to claim that lemons offer a “proven remedy or cure for cancers of all types” is inaccurate. Plus, none of the “largest drug manufacturers in the world” have reported discovering that lemons are “10,000 times stronger than chemotherapy,” as the message states.